The R-PLEX platform offers matched sets of antibodies and calibrators for a wide menu of biomarkers. The R-PLEX Human Vitamin D Binding Protein Antibody Set can be used with other MSD components (see "Recommended Components" tab below) to build assays that measure Vitamin D Binding Protein. These assays can measure Vitamin D Binding Protein alone or in multiplex panels with other biomarkers. 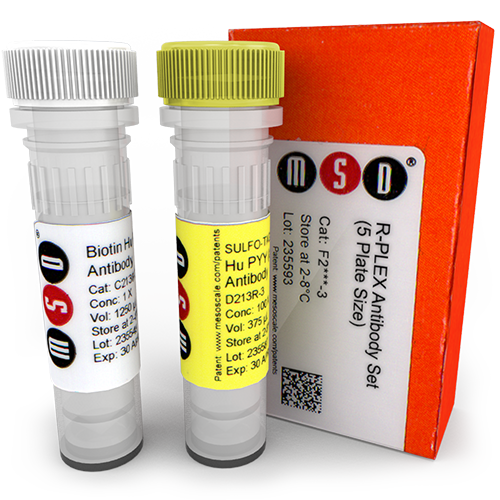 The Product Inserts for R-PLEX Antibody Sets provide detailed instructions for building assays in several formats. The Datasheet for Vitamin D Binding Protein provides lot specific information for the components (including calibrator stock concentration), recommended sample types and dilution factors, and representative data for analytical performance. These items and other helpful documents can be found in the "Documentation" tab below.